OMRI-Listed Nitrate of Soda is one of the only non-synthetic mineral sources of nitrogen, extracting this vital growth resource from the air and the sea. 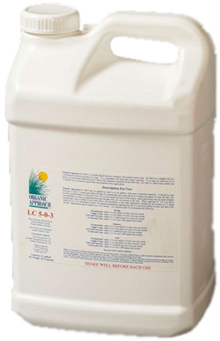 Combined with OMRI-Listed Potassium (Potash), this liquid fertilizer provides extra organic nutrients when needed. With the convenience of a liquid formulation, organic 5-0-3 means no more pre-dissolving powders is necessary! By providing nitrogen that is available during critical growing stages and adverse weather conditions, this liquid fertilizer improves the nutritional quality of turf and crops by increasing protein, albumin, amino acids, vitamin B, and micronutrient content. The Potassium from the Potash provides a vital nutrient for plant and turf cell strength. This product also contains many trace nutrients such as iodine and selenium. • Available in a convenient, quick-acting liquid form. • Made from 100% OMRI-Listed ingredients. This great 5-0-3 combination of nitrates and potassium (potash) is an easy and organic way to build soil nitrogen and potassium levels to increase turf, tree and plant growth. • 5-0-3 Liquid Nitrates and Potassium may be applied alone or as an additive with most companion materials. 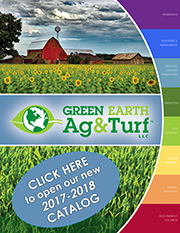 • This product should be used between 0.5 and 1.5 ounces per gallon of water for ornamentals and crops, with no more than 4 ounces per gallon of water for turf applications. • For general maintenance applications, use 1 ounce per gallon of water and spray until run-off. • Applications may be made every 2 to 4 weeks. For more detailed application instructions see the label here.